Today’s lunch, which I always feel brilliant for remembering each summer, was fresh vietnamese spring rolls which each of us could make ourselves. sauces. Also, ideal for using up some raw vegetables while getting a break from salad, and making an entree out of foods you don’t have to cook. The rice paper wrappers “cook” one at a time in a shallow bowl of hot water that you can heat up in the microwave. We made a sweet sauce based on a jar of black bean sauce for the inside, and a sweet and sour sauce based on garlic, fish sauce, sugar, and rice vinegar to dip in, though we mostly poured that over our bites too because we’re not so great at rolling things up neatly. Tastes good anyway, and it’s fun to make your own rollups at the table! I like to make vegetable stock when I have more vegetables than I know what to do with, or something that’s getting a little long in the tooth. I usually make 3-5 quarts at a time – once in a while a little more or even a little less. This is my first batch where I planned for some of the vegetable scraps came from the freezer – leek greens, parsley stems, and celery tops, primarily. I’ll definitely be continuing to save these things in the freezer so I don’t need to have the full mix of vegetables on hand! Add some parsnips that I had a few too many of (I didn’t realize that was even *possible*, last year! 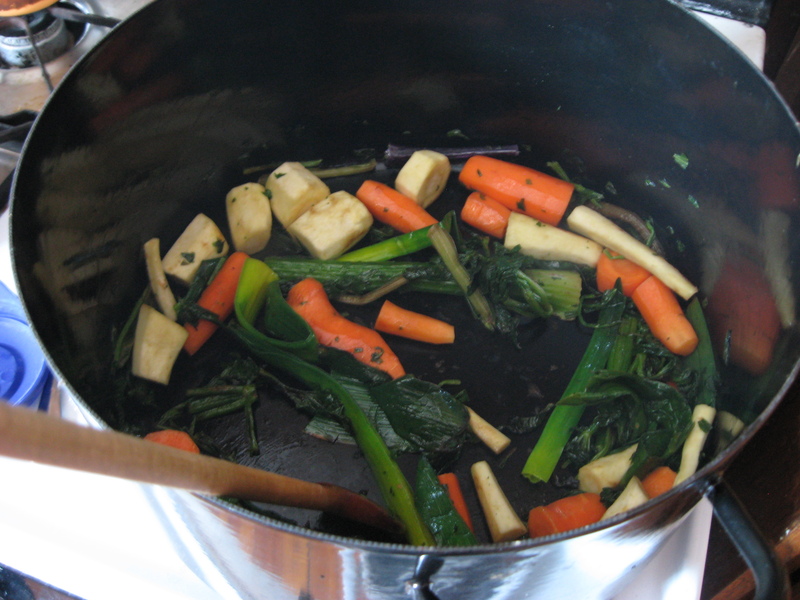 ), and some carrots, brown in the bottom of the stockpot in some oil, and then add plenty of water to make the stock. I also added a leftover cooked butternut squash half we weren’t going to eat. Transfer to the freezer and make matzoh ball soup later, or add to stews and sauces. Brown the vegetables in the oil, letting them develop some good brown spots. Then add about 5 quarts of water and let simmer for 2 hours or so until it tastes good. Spoon broth into containers through a sieve, refrigerate, and freeze. You can reserve the parsnips and carrots to eat – they’ve given a lot of their flavor to the broth, but still have a bit and I presume a bit of nutritional value, so why throw them out? I may not have the whole farmhouse from-scratch operation running smoothly, and I may never keep chickens in the backyard, but making good use of what I have and not throwing away perfectly good food are goals I am getting better at. Here’s a snapshot of my almost-efficient fish machine at work, after 18 deliveries of whole fish since June. I reserved the scrappier bits of the fillets to make a little bit of plain fish for K, who requested that it not all be turned into bakalar (as we call salt cod in our house). Make fish broth with the spines and heads. This is a quick-cooked broth – I put the fish in cold water with bay leaves, salt, pepper, and a splash of vinegar, then bring slowly to a boil, let it boil 10 minutes afterwards, and turn off the heat. After pouring off the broth, pull cooked meat off the fish carcasses into a storage container, removing small bones as I go. This week’s cooked meat mostly went into cod-salad sandwiches with melted cheese. I mix shredded cooked cod with mayonnaise, celery, seasonings; basically pretending it came out of a can of tuna and go from there. I sometimes put it into fish cakes, or freeze to use later for these purposes or add back into soup. I’ll probably make miso soup with some of the broth. The rest is in the freezer. If there’s an Armageddon soon, we’re all covered for miso soup. My 6+ lbs of whole cod (2 small fish worth) gave me 2.2lbs of fillets, plus a bit under a pound of cooked shredded fish meat, and about 4 quarts of fish broth. I would probably have gotten more fillets off of one large fish, but somewhat less broth.